We're all familiar with catnip and how it affects cats. What is less well-known is how it affects humans. No, catnip is not just for cats! Catnip can be used topically or as a tea, tincture or infusion for many different reasons. Catnip is also one of the herbs that has a long history of use for children. Catnip (Nepeta cataria) is a member of the mint family. It's sometimes referred to as Catmint. Even though it seems to produce a euphoria response in cats, catnip will not get you high! Here's an excellent explanation of why it works for cats though. Used to treat cold symptoms. Helps to reduce a fever. Catnip is a perennial in US zones 4-10. It is not terribly picky about where it grows and it can grow well in many different types of soils. Although, it prefers partial shade and well drained soil. Catnip is also a proficient self seeder. 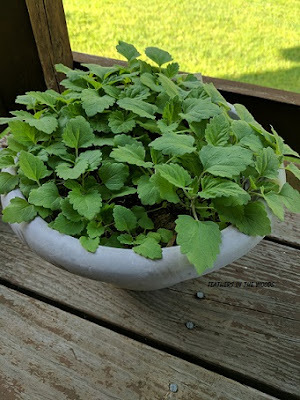 This is a picture of a catnip plant that I put outside in the winter for a sunny day and forgot about, so it froze. No reason to bring it back in at that point so I left the pot out to the end of the winter. It's still in the same spot and this is what it looks like right now. As you can see, the catnip self-seed very well. It also happened to seed itself into every single pot that was near it too. This is one to be careful with. If you stick it in your garden and do not remove the seed heads you will literally have it everywhere with a year. This plant produces small white flowers with little purple dots. The save seeds, wait for the flowers to dry on the stems then snip the stalks and shake the seeds into a bag. The catnip plant does not need much care aside from watering. If you want a bushier plant you can prune it a bit. Just give it a little trim making sure you don't take more then 1/3 of the plant at a time. Allow to grow back before pruning again. Catnip is easy to harvest and dry. After the plant has flowered, simply snip off the desired amount. Either hang the catnip in bunches to dry, or place in a dehydrator on low for a few hours. I store my dried catnip in glass jars as explained in How to store dried herbs. One plant provides plenty of catnip to last me (and the cats!) all winter long! Catnip is the only herb I am successful at growing. I have never tried making trying it myself because my cats enjoy it so that I save it for them. I may have to brew a cup of tea if I can sneak a few leaves in the kitchen without them knowing about it. You should try it! It has a bit of a 'green' taste to it, but I really like it. Do you ever dehydrate your catnip? I put some in my dehydrator and my cat went crazy trying to get to the vent where the air was blowing out of it. lol She just stood there and sniffed it for the longest time! So funny. 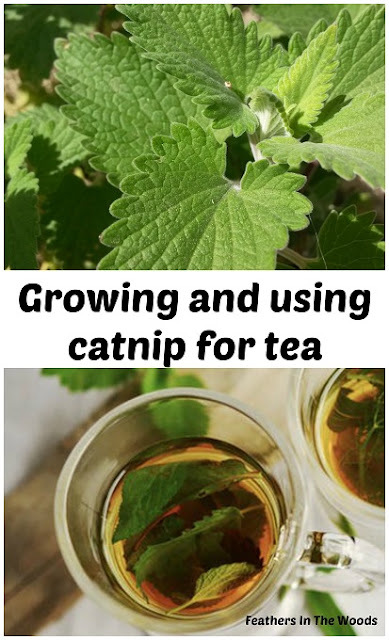 I love catnip tea - hard to grow at my house - with a neighborhood full of cats (and four of my own), the plants get found and enjoyed mighty fast!! Thanks for sharing at the Pleasures of the NW's DIY Party! Something hard to kill is always welcome in my garden! Mine too! The less care the better. Thankfully most herbs are pretty easy once they get started. Good post. I remember my Mom used to use catnip when I was a kid, but I did not know it had this many medicinal qualities. Pinned & tweeted. Congratulations on being featured on Healthy, Happy Green & Natural blog hop. Thanks! I was so excited to see this post was featured! Thanks so much for sharing, I really appreciate it!